From there, walk towards Fortnum & Mason: their shop windows this year are inspired by “togetherness”, with fairy-tale like scenes sure to make you feel all warm inside. Do step in too – a giant sun and moon’s embrace is suspended in the atrium. On the other side of the street is Burlington Arcade with its elegant roof top and its oh-so-tiny-but-so-elegant boutiques, each framed by trees blossoming into tiny flowers of lights. On the other side is Old Bond Street with its exquisite selection of jewellers and haute-couture shops, decorated with fir tree branches weaved into garlands, as they would have been a century ago. Don’t forget to look up to gaze at the peacock feathers illuminating the sky. 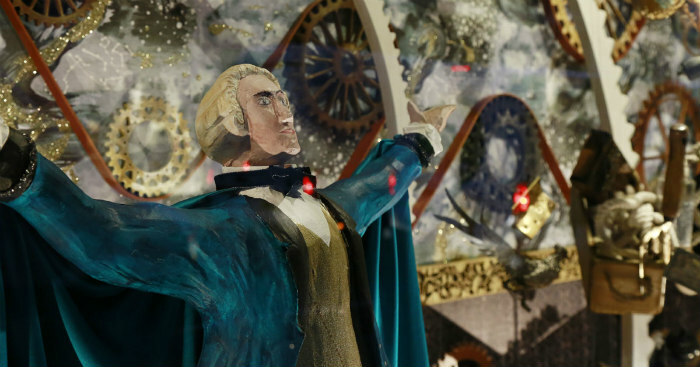 There is more still… Liberty’s shop windows recreate the atmosphere of The Nutcracker – half toy world, half ballet. 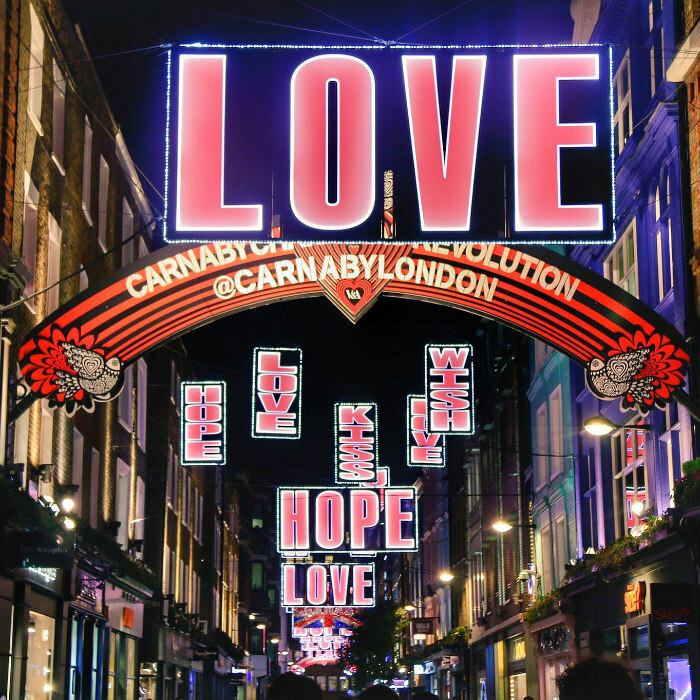 Right around the corner is Carnaby Street and its neon messages of love, inspired by the Swinging 60ies exhibition at the V&A. The last stop has to be Covent Garden, with its 45 giant mistletoe chandeliers: they simply call for a kiss of a hug! It’s not about adding a Christmas tree here, a few garlands there. It’s about making eyes sparkle in delight, bringing this little twist that will make you rediscover the magic of the season entirely. One Aldwych, for example, has a 25 foot Christmas tree in its lobby, adorned with 140 mini champagne bottles. Add to this thousands of pearls, decorative leaves, glitter… What a place to sip on a festive cocktail! How about a Mistletoe Punch (saffron infused Courvoisier, Grand Marnier, Perrier-Jouët champagne, pomegranate and orange juice) for a sparkling time? The Savoy preferred to see la vie en rose. Its tree, designed by Boodles, comes in soft shades of pink. The real surprise is the foyer, though, themed as an ice-rink! The Ritz has draped its sumptuous columns in red velvet and gold, added garlands of baubles to the halls. Head straight to the rotunda, where a 25 feet high Christmas tree, covered with shimmering baubles, gigantic red velvet bows and twinkling lights will simply take your breath away. Claridges went for a different approach – an immersive one! No Christmas tree but a whole room turned into a Narnia-esque snowy landscape with pictures of silver birch and fir trees projected all around. The best way to catch up with friends, to plan new adventures for 2017 with you loved one and, well, relax. Christmas is, after all, about slowing down and enjoying the moment. Expect extra cuteness at The Lanesborough: apple and cinnamon donut topped with an edible holly leaf, a mousse sphere you could mistake tiny orange, a Christmas tree shaped cake… The Goring’s afternoon tea too is as delicious as it is Instagram friendly with its gingerbread snowflakes, chestnut snow man, pistachio Christmas tree and more. 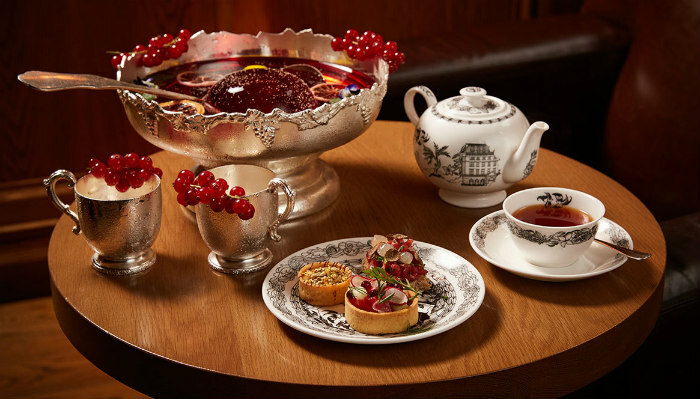 Last but not least, let’s mention The Dorchester – sculptural cakes and mince pies of course to be enjoyed while listening to a choir singing Christmas carols! It’s the thought that counts… but isn’t it nice when you find just the perfect present? If you choose only one place, make it the Fortnum & Mason galleries at the Somerset House, right by the superb ice rink. Each room is themed (for her, for him, confectionary…) and it’s impossible to leave empty handed. Their Buck’s Fizz marmalade with a little golden sugar or their shimmering strawberry preserve is sure to be a hit. Don’t miss their Christmas ornament, inspired by their iconic afternoon tea and hives! Liberty is, of course, a must. Their flowery fabric is a classic… but if you fancy a more modern style, have a look at their Little Malborough Tote Bags, a little funkier, which you can customise too. Fashion wise, you can never go wrong with a Burberry accessory, whether a cashmere scarf or their refined umbrellas. Those are passed from a generation to another! If you are shopping for a more outdoorsy person, the Highland Store has an outstanding Barbour collection. And for the man who has everything, or simply as a gift to the perfect host? Stop by Berry Bros wine merchants, if only to mention that Buckingham Palace orders from them. The shop hasn’t changed much since the 17th century, even the floor is original! Ask for the King’s Ginger: a spiced liqueur they created for King Edward VII, who wanted a little something to warm him on his horseless carriage. His Daimler, of course! There is a secret to extra luxury in life, London included… A Diners Club Card, one of the first real travel and entertainment focused charge cards. Why do we love it? The membership costs a mere £50 a year and allows you to collect 1 reward point per £5 spent, which can then be turned into vouchers (Amazon, Virgin, Ticketmaster, Selfridges…) which already is a nice treat. But really, every traveller should have one: after all, it gives you access to over 700 airport lounges around the world at a VIP rate, a valuable asset when you are used to switching from one country to another for business meetings. Let alone, delayed or cancelled flight/delayed or lost luggage are covered up to £450… And you get 56 days interest free credit on all purchases and ATM transactions. Then come the privileges. Take the hotels mentioned above, for example. Being a Diners Club member gives you an immediate elite status, coming with flexible check-in and checkout times, room upgrades… The Ritz, for example adds a complimentary daily breakfast for 2 and a unique present in your room, Claridges a £40 food or spa credit, One Aldwych free breakfast, a fruit basket in your room, a free meal at their Indigo restaurant. Talk about a return on investment! And to make your life simpler, Diners Club has developed an app. This comes with an ATM locator, a tipping and currency converter, an airport lounge guide. Even better – simply connect and it will feature on the map the privileges listed where you are. The best way to make the most of your card within seconds and add a little extra to your trip!